I have just set up an Obi110 to use with my VOIP connection thru Exetel, and have successfully routed my outgoing calls thru the Obi, via a cordless phone attached to the Phone connection on the Obi. I also have a Telstra line on which I receive incoming calls, on a connection point not attached to the Obi. I am trying to set up the Obi to route the incoming calls to the cordless phone. This has not been a problem with previous VOIP enabled routers and a Grandstream ATA, but I do not seem to be able to set up the Obi to do this. I have a Netgear DGND3700V2, and have the latest firmware for the Obi. I have used the XML file change the settings to Australian conditions and have trolled thru numerous articles to solve my problem and feel that it is just a matter of some setting that is not right. When a call is incoming, the cordless will ring briefly then go silent and logs off after about 7 seconds. If answered, the dial tone is heard. Can you make outgoing calls via the PSTN line? Dial **8 followed by number or press "#" which will connect you directly to the PSTN line, then dial number. Make a note of which boxes are checked. Then uncheck all four boxes that start with the word "Detect ..." If this solves the problem, then try checking any required boxes one at a time to see what works. Make changes via the OBi Expert Configuration pages. From your OBi Dashboard, click on your OBi number and follow the prompts to get there. To change a value uncheck both boxes to the right of the value and leave them unchecked. After changing the values on one page, press submit at the bottom of the page and wait a few minutes for the OBi to reboot. I tried to call using your suggested method but I may have mucked it up. However, I did uncheck the boxes as suggested and that seems to have partially solved the problem. I now have a bridge that works, my Telstra line is directed to the cordless as I wanted, but the connection is not of high quality, with a bit of an echo, any suggestions to improve that. If not I am happy to at least answer the phone without rushing to the fixed line! I made the changes directly by logging on to Obi thru my browser, I haven't sorted out Obi Expert yet, or registered my Obi number. I am also wondering can I use Google Voice? Further to my previous reply, my problem is not solved, as the changes converted my primary line back to the PSTN line so it probably worked because of that. I can no longer make outgoing calls on my SP1 line as I want to, so I am now changing those 4 boxes back to default one at a time to see if that works, and I will again attempt to make a callas you you originally suggested thru using the ** etc. Setting the Primary Line only affects outgoing calls. By default, all incoming calls should ring the phone connected to the OBi110 Phone Port. I'm assuming that your PSTN line is connected to the phones in your home and by a further connection to the OBi110 Line Port. The echo may be a result of an impedance mismatch between the OBi and the PSTN line, which may be made worse if volume levels are too high. Volume levels can be changed in the Phone Port settings, but if the levels seem ok when you are talking on the voip service, then I would only change them as a last resort. I'm not a Google Voice expert, but I believe you can use it in most countries, although calling for free only works within North America. It is tricky but not impossible to configure Google Voice in countries outside USA (and Canada?) But once configured it can be used anywhere (except where blocked by administrations). Calls to N. American numbers are free regardless of where the calling GV terminal is located. Sounds like GV is too much trouble to worry about without any real gain. Ianobi, your info re the use of Obi Expert or the web browser probably explains why all my settings seemed to change without me doing it, like the DigitMaps, so I will disable that feature as I am getting quite familiar with the browser interface now. I will play around with the impedance as that sounds like a likely solution. I disabled the Obi Expert from the interface and unchecked the 4 boxes relating to port detect properties as you first suggested, and changed all my DigitMaps to those for Australia. The phone now works for incoming and outgoing calls as I want it to, but the sound quality is not really good so I will play around with the Impedance. Thanks for your help, and I have 2 more questions. How do I speed up the time between the phone ringing on the other connection and the one thru the Obi, and are there any other simple things you can suggest to tweak the system? 1. Ringing delay. Have a look at Physical Interfaces, Line Port, RingDelay. Check that the Australian xml has changed that from the US default of 4000 (milliseconds) to 400. 2. 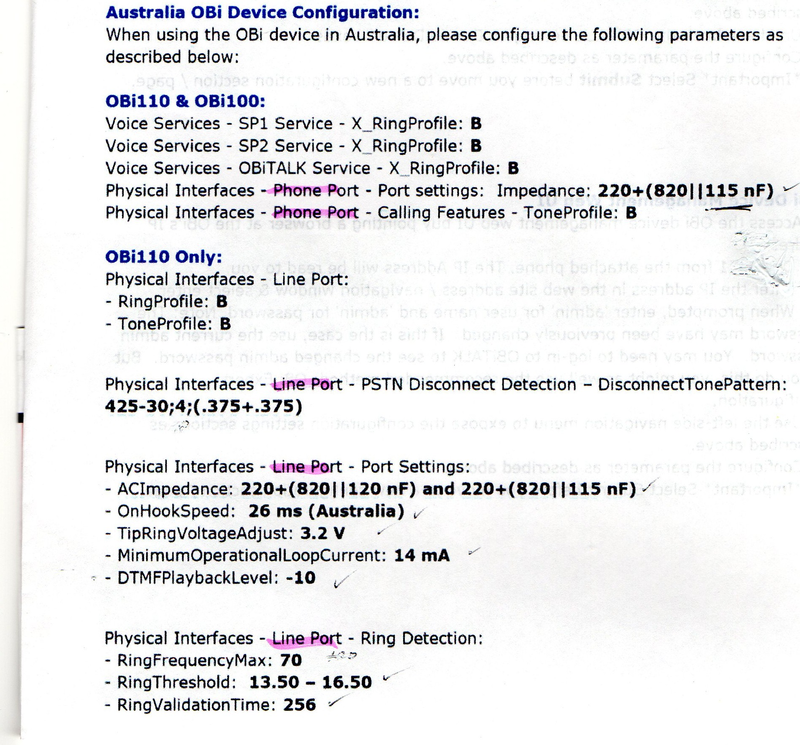 Regarding call quality from the PSTN line through the OBi. Can you temporarily disconnect anything else that is also on that line so that the Obi is the only device on it? Does the call quality improve and to an acceptable level? The ringdelay has been changed to 400 but there is still a couple of seconds delay, about 2 o3 rings. It is a problem that I can live with so I will reduce that and see what happens. If I can’t change it I will not lose any sleep over it. I changed the impedance to 270+(750||150 nF) and 275+etc and that seemed to improve the sound quality to an acceptable level, so I will not worry about changing that. Getting a perfect impedance match between the OBi Line Port and the PSTN line involves trial and error, unless you are very lucky and have the perfect PSTN line and perfect house wiring and no other devices attached to the PSTN line. If enabling one results in your original problem coming back, then disable it again. If the caller and callee both hang up on a call, then normally the call will disconnect with no problem. However, some equipment or some information lines may keep the line busy even if you as the caller hang up. This is why the PSTN Disconnect Detection settings are there. Again, some trial and error. If you are not getting any problems then no need to worry. In setting up I disable all sections on the Auto Provisioning Page so I have full control of the web settings. Then I like to manually enter all settings. So if all else fails reset it to factory default and use these settings and see if it works for you. Thanks for your input NoelB. Everything is working ok now and I am just trying to tweak things. Most of what your link shows is as I have it anyway but I will change any differences and see what happens.